The Chancellor took the higher education sector by surprise with his announcement that student number controls would be abolished, paid for by the sale of the student loan book. 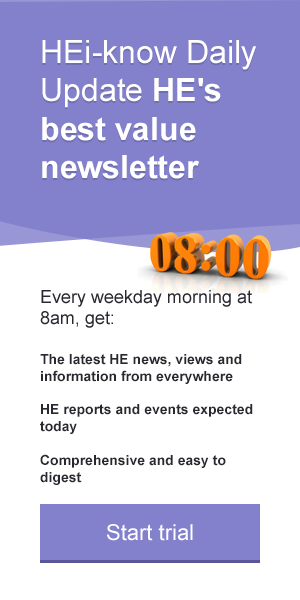 Media FHE looks at how higher education leaders and experts have responded to the news. Philanthropic support for universities has grown faster in the UK than in the United States for the past five years, reaching £774 million last year, analysis by the ratings agency Moody's has shown. The urge to fly the family nest and study in another part of the country is as strong as ever among would-be students despite the rising cost of a university education, a national survey has found. A record number of students found places on full-time undergraduate courses this autumn, with more students from low income households entering higher education than ever before. The government’s plan to remove student number controls is “credit positive” for UK higher education, but will mean greater challenges for universities with weak market positions, the ratings agency Moody’s has said. The Government has spelled out the consequences for private higher education providers that over-recruit, in a new set of guidelines on student number controls. Universities UK has withdrawn a case study in guidance suggesting that gender segregation may be permitted on campus under some circumstances, following criticism from the Prime Minister and the Education Secretary. The full extent to which postgraduate programmes in England are being propped up by demand from international students has been revealed in a government study. The University of Derby has announced the appointment of Professor Rod Dubrow-Marshall to the post of Deputy Vice-Chancellor. A raft of measures to encourage more UK students to study or take work placements abroad has been launched with government backing. The UK’s net migration target should be abandoned as it creates a “perverse incentive” to cut international student numbers, an influential think tank has recommended. The UK’s global reputation for quality in higher education is based largely on research in its most prestigious universities, and much of this is due to the achievements of scholars from other countries, according to Bahram Bekhradnia, the outgoing Director of the Higher Education Policy Institute. Only half of black and minority ethnic students achieved top degrees in the UK last year, compared with more than 70 per cent of white students. The UK has become a less attractive study destination thanks to its restrictions on work after studying, according to a poll of prospective students in India. The best universities and businesses supporting postgraduate education have been recognised in the first ever Prospects Postgraduate Awards. A new strategy on access to be published by the Department for Business Innovation and Skills is expected to call for greater collaboration between universities, schools and colleges both regionally and nationally. Research funding may be frozen once again in the government’s next comprehensive spending review, a senior civil servant has warned. “Crowd funding” on the internet may be trialled by the Higher Education Funding Council for England (Hefce) in its search for new ways to support postgraduate study. Professor Martin Hall has been appointed as the new chair of Jisc, succeeding Professor Sir Tim O’Shea. University of Leicester will become the first top 20 university to launch a major paid internship programme to campus-based home or EU student undergraduates. The 1994 Group has announced it is disbanding after 19 years of representing small research-intensive universities in the UK. Policy-makers and higher education leaders will need to make difficult financial choices if universities are to satisfy unmet demand for places, a study of the funding challenges facing the sector suggests. The overall accuracy of teachers' predictions of A level grades dropped to 42 per cent when the A* grade was introduced in 2010, a government-commissioned study has found. More than half of UK universities do not pay some of their staff enough to cover standard living costs, the National Union of Students (NUS) and Unison have claimed. Applications from overseas students for courses starting next year that require top grades -- at Oxford and Cambridge universities and medical,dentistry and veterinary schools -- have risen by 10 per cent, new figures show. The current system of financial support for postgraduate students is failing and in urgent need of an overhaul, a new report from the 1994 Group says. Higher education organisations and stakeholders have been invited to provide views and feedback on the National Student Survey to a "fundamental review" of the NSS. Graeme Osborn, a York University politics graduate, has been appointed as the Higher Education Funding Council for England's first board member with specific responsibility for the student interest. Students who work while they are at university fare significantly better in the jobs market when they graduate, new research has revealed. A “perfect storm” of factors that have hit household budgets and incentives for mature people to study has brought about a sharp drop in the number of part-time undergraduates, a national investigation has concluded. Fusing technology and creative design in research and development benefits economic growth, a two year study has concluded. Universities should be at the tip of a new British invention revolution turning ideas into job creating businesses to help boost the UK economy, a new Government-commissioned report argues. The number of UK university students taking courses or working abroad through the Erasmus scheme has risen by 7 per cent to a record high, according to new figures. Queen's University Belfast has announced that Professor Patrick Johnston, currently its dean of medicine, dentistry and biosciences, is to be its next President and Vice-Chancellor. Lifting the tuition fees cap to £16,000, as proposed by Oxford University’s Vice-Chancellor, would lead to an inequitable two-tier higher education system, a universities think tank has warned. The Government has announced a package of investment in the "eight great technologies of the future" involving universities in key initiatives to drive forward advances. Student leaders have condemned proposed regulations in the Government's immigration bill as "unworkable, unwelcoming and discriminatory". The UK will be one of the world’s fastest growing destinations for international students over the next decade, according to a new report from the British Council.